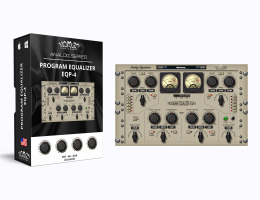 The Nomad Factory Program Equalizer EQP-4 is a full range stereo channel unit, featuring low and high cut, low and high frequency boost and attenuation (shelving or peaking) as well as two overlapping bands of equalization. The two mid-range frequency sections has variable bandwidth, boost/attenuation (peaking) and frequency selector. All these features allow the Program Equalizer EQP-4 to handle several EQing chores, from the subtleties of mastering to radical tone shaping often needed during tracking. The simple beauty of these EQ is nothing else than amazing!. Intended to recreates the warmth of classic analog hardware equalizers, the Program Equalizer EQP-4 will add that magic touch to your music.